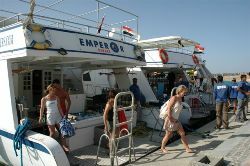 For your diving & liveaboard holiday to Red Sea & Egypt, Mini Liveaboard with Emperor divers is a perfect way to sample a liveaboard, embark from Shark El Sheik, usually cruising to Tiran Straits, Ras Mohammend, SS Dunraven and SS Thistlegorm (depending on weather conditions). 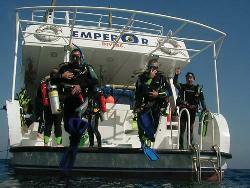 To fully enjoy the diving programme a minimum of 15 logged dives is recommended. The King Snefro liveaboard sails from Sharm El Sheikh Port and is a 40 minute transfer from Sharm El Sheik Airport and hotels. The liveaboard accommodates up to 12 divers in 6 air-conditioned cabins; 2 ensuite and 4 sharing 2 bathrooms. The salon has air-con, TV, video, CD, DVD and a central music system. The dining area serves meals, snacks and drinks. Special requirements can be catered for. The diving area has two ladders off the dive platform and a Zodiac. Sinai Mini Cruises are perfect for 'a taster safari'. Whether you're a beginner or an experienced diver, there is always the right dive for your level of experience. We recommend a minimum of 15 dives and Advanced level to share the experience of the deeper dive sites such as the wreck of the Thistlegorm (max 32 metre depth) and drift-dives like Ras Mohamed (drop-offs/drift diving). Open Water divers can enjoy the majority of the dives or opt to take the Advanced OWD onboard to broaden the enjoyment.